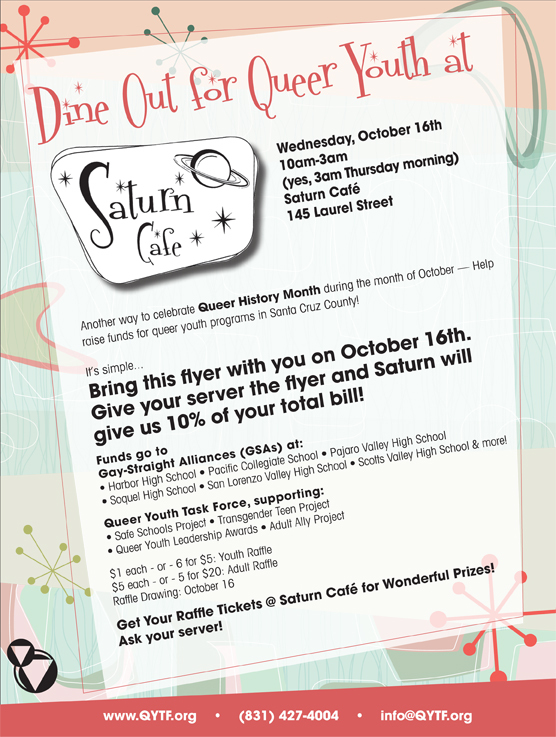 Community members turned out for another successful outing at the Saturn Café for the third annual “Dine Out for Queer Youth” — dining with family & friends while raising funds for queer youth projects in Santa Cruz County. Some of the raffle prizes for adults included two (2) Mount Hermon Redwood Canopy “Zip Line” Tours, Value $180, Fused Glass Platter from Patsy’s Studio, Value: $60, Artisans Gallery necklaces, Value $65 each and more. Some of the raffle prizes for youth included a Saturn Café T-shirt, Peet’s Coffee & Tea Gift Cards, Mount Hermon Hooded Sweatshirts and more. Special congratulations to San Lorenzo Valley High School Queer-Straight Alliance that sold the most tickets for the raffle. Thank you to the entire staff of Saturn Café in Santa Cruz!